My friend Beth gave me an assignment – create a vegan (non-dairy), gluten-free, fat-free (or close too it), additive-free Eggplant Parmesan to use in Sandwiches. You know how I am, can’t resist a challenge. So I started experimenting. Many of the recipe components can be found on the Basic Recipes Pages: Tapioca Eggs, Cashew Cheese and Quick Italian Red Sauce. Please refer to that page for the specific recipe otherwise this post is going to be way to long. Every cook has their basic ingredients. You know, the 10 essential things you NEED if you are going to cook! Let’s assume that salt and pepper are already in the vicinity. 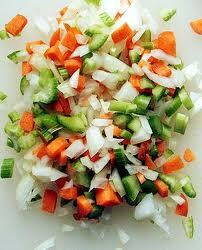 Many of my entrees and soup start with the first five – onions, garlic celery, carrots and olive oil. Sautéing them up every time I want to cook is a time waster and a nuisance! So I use the traditional French approach and keep mirepoix in my fridge. For those of you who have a little trouble with weird French pronunciation — it is pronounced meer-pwah. About once a week I pull out the food processor and make a good size batch. There are as many ways to make mirepoix as there are French and Cajun cooks. Remember, making it is an very inexact science. It is a matter of taste and what you have available. Honestly, it is a trial and error process. To help you I have written down my recipe as a guideline. There is really only one rule — HAVE FUN!! 4. Stir well and cook on high for about 5-10 minutes stirring occasionally. *A note about garlic: I would not even attempt to give you a measurement on the garlic! Especially since it would be hard for me to define “too much”. We love the stuff and buy it at Costco or Sams Club in 48oz jars. It makes no sense to me to spend time peeling, crushing, dicing etc! I won’t even tell you how long (actually short) 48 oz lasts us; you’d be appalled!